The paving contractor has to have the experience, equipment and materials to install commercial, and even industrial grade paving because traffic and use on commercial properties is much higher and heavier. Your commercial paving contractor also has to understand that the pavement itself is not merely a utilitarian endeavor—smooth, well-installed and maintained roads, parking lots, walkways, etc. have a big impact on curb appeal, which can project a positive image for the property. Safety is paramount: well-maintained asphalt and concrete decreases safety problems and protects you from liability. 1. An experienced paving contractor with 4 decades of experience working with commercial property owners. Espina Paving, Inc. has been serving commercial property owners for more than 40 years and has extensive knowledge, experience and equipment especially designed for large-scale commercial paving jobs. And because we’ve been in business for so long, it’s easy to check references from previous customers as we’ve done work all over Northern Virginia. 2. A commercial paving company with the equipment, crew and materials for large-scale, commercial paving projects. Espina Paving has exclusively worked with commercial property owners through our 4 decades of service to the Virginia, Washington DC, Northern Virginia community. We have done paving jobs for Reagan National Airport, numerous towns and villages throughout the area, schools, hospitals, retail outlets, homeowners associations, apartment complexes, churches, banks, restaurants, hotels and more. You can even see us doing some of these major jobs on our Espina Paving YouTube channel. 3. A commercial paving contractor who communicates with you. Communication is the essence of any successful project. As an experienced paving contractor for commercial property owners across the area, we make sure to give you a detailed description of the work that needs to be done and listen to your concerns as the property owner or manager. We provide a detailed quote system and keep in touch with you throughout the process to ensure we help you get the job you want, within your budget. 4. A commercial paving contractor who puts your needs (and those of your customers, tenants, etc.) first. Flexibility is an important part of being a paving contractor for commercial property owners. Any downtime your parking lot or roadway has impacts your customers, students, residents, employees, etc. and can impact your ability to do business. We will work with you on a plan that minimizes downtime and decreases the impact on your business or organization while we get the job done. We can pave overnight or during other off hours and have several techniques for helping traffic flow around the job. Espina Paving insists upon doing each commercial paving installation to the highest standards of quality, safety, environmental protection and customer satisfaction. We strive to help you stay on budget and find ways for you to save money without sacrificing quality—in fact, our maintenance schedules help you get the most out of your commercial paving investment for years to come. 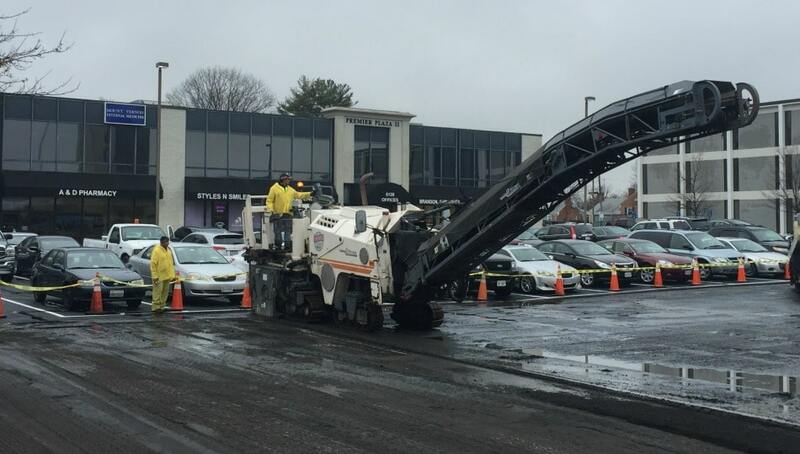 Espina Paving is the Northern Virginia paving contractor for commercial property owners. Request a free estimate for commercial paving services today. We look forward to hearing from you at (703) 491-9100.